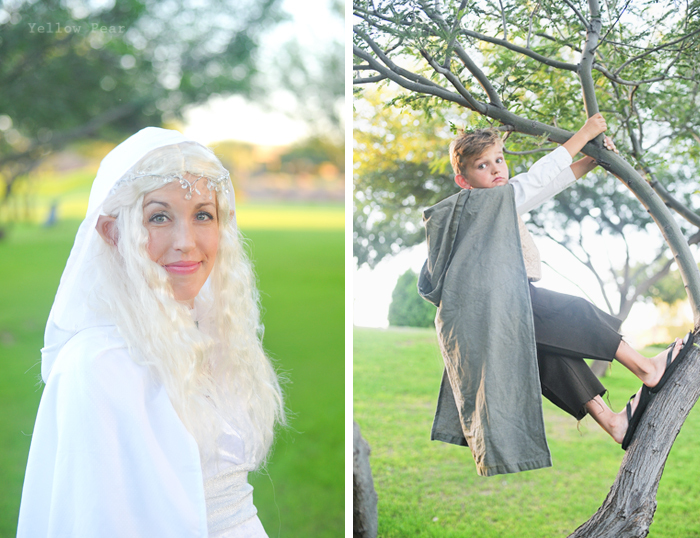 Miss B decided to be Tauriel from The Hobbit: The Desolation of Smaug. 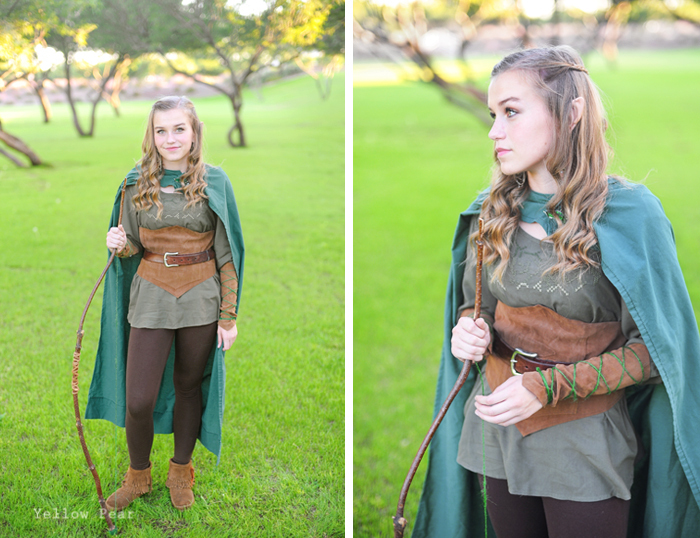 We loosely based her costume off of Tauriel's from the movie, including a green tunic, brown leggings, leather bodice, leather arm guards and a bow (that she hand-made and is super proud of). We also added ear tips and pulled her hair back in Tauriel style. She wore the awesome moccasins she just got for her birthday for a woodsy look. 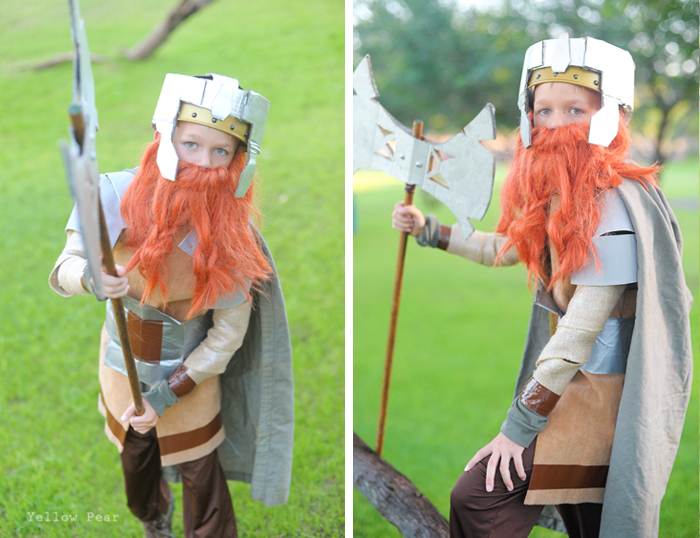 Dennis chose to be Gimli the dwarf. I had a great red beard from last year's Halloween clearance and we bought a leather vest off of eBay. Miss B constructed the rest of his costume with duct tape, some of her armor re-purposed from last year's costume and metallic burlap ribbon for the chain mail around his arms. She also cut out designs in her ax from last year that are similar to Gimli's. I added silver cardboard accents to an existing viking helmet to recreate the battle helmet. 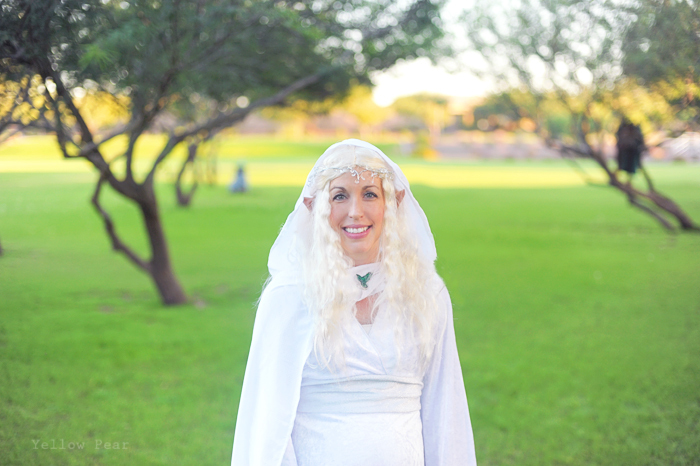 I was Galadriel the elf...mostly because I already had a white dress with long, bell sleeves. :) I made a hooded cape for me as well as for everyone else. I found a great, quick tutorial and busted five of them out in one afternoon (actually six because I made one for a friend). I made mine out of an old, shimmery shower curtain, Dennis and Q's out of a brown curtain that I bleached and then dyed grey, and Miss B's and Mr. C's from old sheets. I also bought myself and Miss B elf ear tips from eBay and we "painted" them to match our skin with foundation and dusted them with my face powder to hopefully make it last the night. It ended up working great and they looked fabulous! They definitely made our costumes. I also bought a few Fellowship leaf pins from eBay...and although Galadriel doesn't technically wear one, I added one to my costume anyway. I finished off with a crazy blond wig and a crown I twisted together with some jeweled wire I had in my stash. 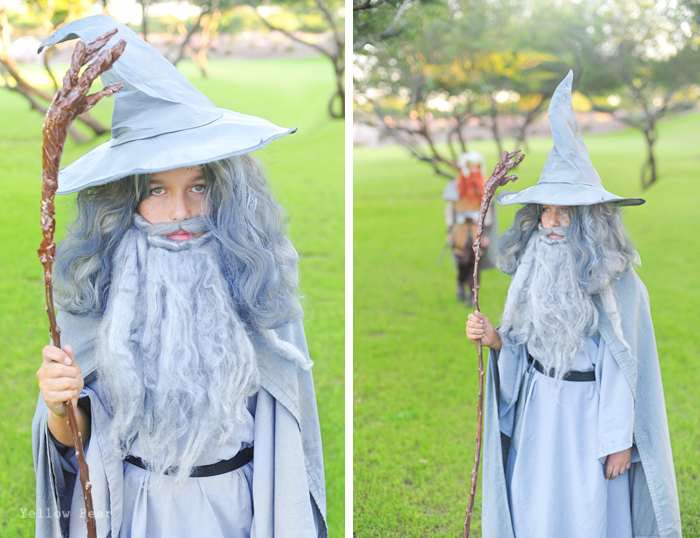 We had a fabulous night trick-or-treating around the neighborhood. The two oldest went with friends, so it was just the two littles with Dad and I. 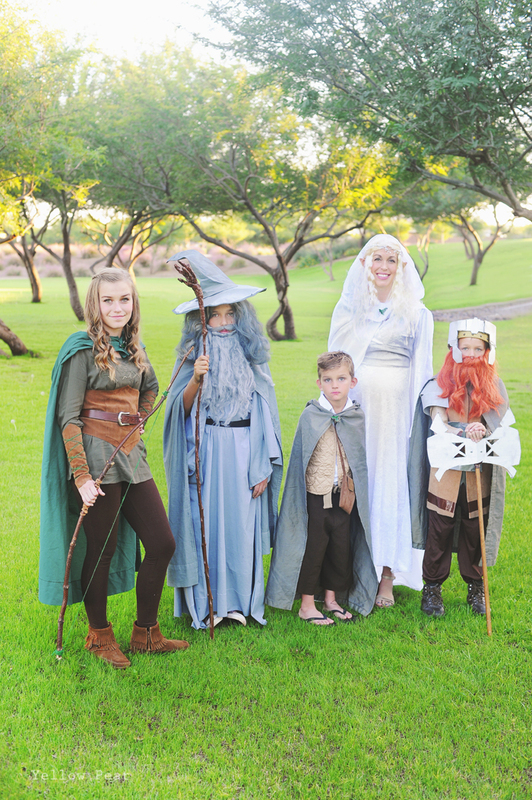 People loved their costumes and some even gave them extra candy. :) I did end up with a nice wig indent on my forehead and a headache to match, and poor Dennis was soo sweaty with all of his armor and beard and helmet...but they had a blast and got waaaaay too much candy! Another successful year. You guys looks awesome! 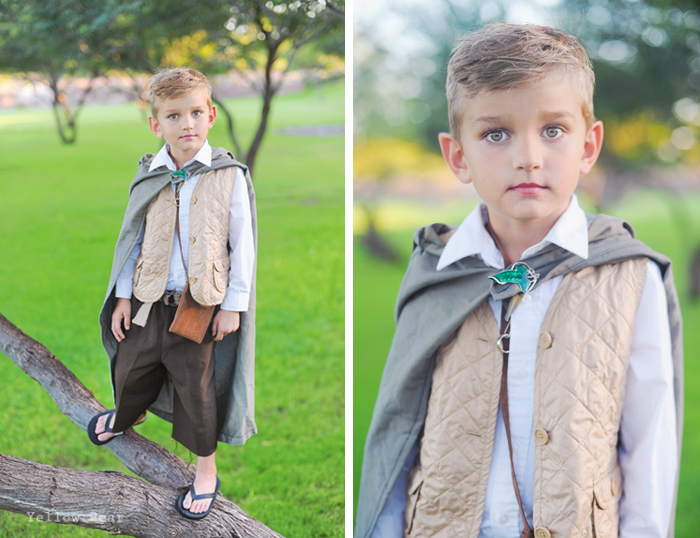 Love the ears and Q as Frodo is adorable! Thanks T. I actually like working on them, so it's not too big of a deal! :) Annnnd that's why we have to take lots of pictures...to document our hard work!